Break out your dutch oven! Here’s a great fall dish! White beans and some browned sausage cook with white wine, broth, onion, and lots of garlic and herbs for nearly an hour. 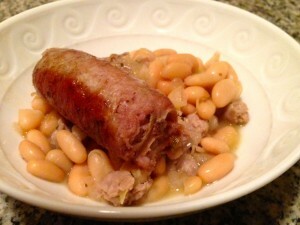 The tender and flavorful beans are served with sweet Italian sausage on top. Serve with a green salad or crusty bread. A couple of notes: I actually forgot to buy fresh thyme and didn’t realize we were out of bay leaves. I added about 1/2 teaspoon of Herbes de Provence along with the parsley. I also seasoned with a bit of salt and pepper when I added the butter in the final step. I’m happy to be reunited with my Le Creuset Dutch Oven. Look out for many more stews, soups, and braised dishes as the cooler weather takes hold! Heat 2 Tbsp. oil in a large heavy pot over medium heat. Add onion and garlic; cook, stirring occasionally, until softened, 5–8 minutes. Remove and discard casings from 2 sausages; add sausages to pot. Cook, breaking up with a spoon, until sausages and onions are lightly browned, about 5 minutes. Add beans and wine to pot and cook until wine is reduced by half, 8–10 minutes. Using kitchen twine, tie parsley and thyme into a bundle; add to pot along with bay leaves and broth. Cook on medium-low heat, partially covered and stirring often, until liquid thickens, 40–50 minutes. Discard bundle and bay leaves. Mix in butter and 2 Tbsp. chopped herbs. Season with salt and pepper. Meanwhile, after beans have been cooking for about 25 minutes, heat remaining 1 Tbsp. oil in a large skillet over medium heat. Cook remaining sausages, turning occasionally, until browned and cooked through, 15–20 minutes. Slice. Divide bean mixture among bowls. Top with sausage slices and remaining 1 Tbsp. chopped herbs.